Confidence release date was Friday, April 25, 2003. 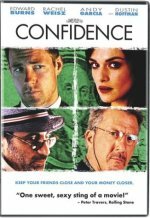 Following in the long tradition of heist films, "Confidence" tells the story of con man Jake Vig (Ed Burns), who gets a few thousand dollars from a victim who is actually a powerful crime mogul's accountant with the help of his friends. When the mob boss, appropriately named "Boss" (Dustin Hoffman), finds out, Jake and his pals have to cut a deal to pay him back.